There are several saunas to choose from at SALT, including one of the world's larges saunas, open every weekend. Sometimes you can find DJs and music in the sauna Friday and Saturday. Sundays we chill out! Naustet is partly built of driftwood found along the seashore, and furnished with details that may remind you of your grandmother's cosy living room. At Naustet you can get real Norwegian waffles with brown cheese, baked goods, coffee and drinks. A few times a month you can find a late night marked at SALT. We invite both local and not so local shops and artists to us to sell their crafts. In Langhuset we host concerts, events and art exhibitions. Sometimes you can even go clubbing there! Under Lillehjella we host our outdoor cinemas, art exhibitions and other events. 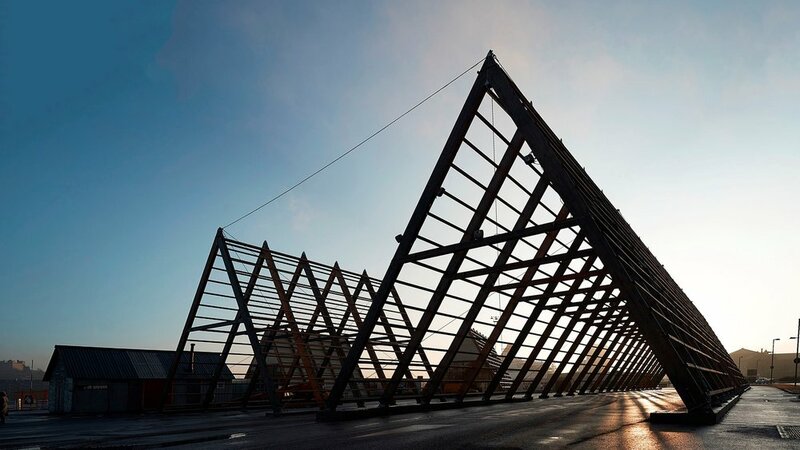 The Arctic Pyramid is a majestic fish rack, towering like an open tunnel over the seaside promenade between the Opera house and Vippetangen. SALT fills it with art, culture and our many visitors. Welcome to the Bazaar, a bedouin inspired tent in the heart of Oslo. At 450m2, there's plenty of space to chill out in cozy booths. Right by the fjord, in the heart of Oslo, SALT is located with our three different saunas. No matter if you’re looking for a good sweat with the gang or want to kickstart your weekend dancing together with a bunch of strangers in their bathing suits, we’ve got what you need. Árdna, the Naustet sauna and the barrel saunas will suit everyone, either you’re a beginner that prefers 60-70°C or an experienced sauna enthusiast testing your limits in up to 100°C or more. Check out our different sauna concepts below to see what fits you, your friends or your group best. Every Friday-Sunday you can book a 3 hour sauna session in our biggest sauna, Árdna, with a capacity of 80 people in the amfi. It’s one of the worlds biggest saunas and holds a temperature of 60-80°C, a perfect location for a nice and slow cook overlooking the city of Oslo. Most Fridays and Saturdays we dance and party with DJs, concerts, performances and more, while Sunday is the day for total relaxation and finding your inner peace. With a ticket to sauna session you can also use our barrel sauna, as well as the cold water tubs. Check our calendar or Facebook page for the full program. 50% off for children from 7-14 years, free entry for children under 7 years. Groups over 10 people must send an inquiry to info(at)salted.no! Book your tickets below or take the chance on drop-in (no entrance guaranteed, but we have a waiting list). The last chance to enter the sauna sessions is 45min before each session ends. The three hour sessions start at 12pm, 3pm and 6pm. Guests under 18 years are not allowed in the sauna in Árdna during the 6pm session. Every Saturday and Sunday morning we open both our Naustet sauna and the barrel sauna, as well as the cold water tubs, for you to start your day off right! Sweat out the toxins in your body and cool down in the tubs when it gets too hot. Book your tickets below or take the chance on drop-in (no entrance guaranteed). The sessions in the barrel sauna starts at 9am, 10am and 11am. Be precise to get the most out of your hour in the sauna. We don't recommend groups of more than four people to book tickets for these sessions. We have two different saunas that can be booked for private groups; the sauna in Naustet and the barrel sauna. The Naustet sauna is located in the back of café Naustet and can take up to 8 people. It can be booked for 2-hour sessions, with it’s reception at the bar in café Naustet. The temperature inside the sauna is between 75-90°C. During a session there is a small changing room and a shower available in Naustet. The price is 830nok and includes up to 4 people. If you are more than four people, you can buy up to four additional tickets (200nok per extra person) in the bar in Naustet upon arrival. Book tickets for the Naustet sauna below, or take the chance on drop-in (no entrance guaranteed). The other private sauna is the barrel sauna, a 100 years old, 7000 litre aquavitt barrel, which can reach up to 90°C and is located beside Árdna. This sauna can take up to 8 people and be booked for a 2-hour session. In the same area there are both a hot and a cold shower, as well as two cold water tubs we can fill up upon request. The barrel sauna is only available for drop-in (no entrance guaranteed) tuesday-thursday between 5PM-9PM. The ticket costs 250nok. During the weekends it’s used for guests in the sauna session in Árdna. Bring your own towel or rent one in the bar for 50,-. You’ll need a padlock during sauna session, barrel sauna and the morning bath & sauna, and if you don’t bring your own you can buy one for 50,-.Wardrobes are right outside Árdna and we also provide two outdoor showers. Bathing suits are required in the sauna and we recommend you bring your own flip-flops since the floor can be hot. Please note that you’re not allowed to bring your own alcohol and that guests under 18 years are not allowed in the sauna in Árdna from during the 6-9pm session. Our sauna memberships cost 800nok per year and gives the members access to discounted tickets to our public saunas. Memberships can only be bought in the bar in Árdna during opening hours. Please note that the online pre-sale for the sauna session in Árdna closes at 3pm on Fridays and 12 pm on Saturdays and Sunday. If you miss the pre-sale you’ll have to take the chance on drop-in. Most days we can do drop-ins, but you are not guaranteed entrance if the sauna gets fully booked before you arrive. The pre-sale for the sauna in Naustet closes at 11am the same day. Any more questions? Maybe we have answered them already. Have a look here. In collaboration with the The Finnish-Norwegian Cultural Institute we are presenting Kaarina Kaikkonen's massive installation “We Are Still The Same” in the Arctic Pyramid and in collaboration with Høstutstillingen we are presenting Pøbel & Vardø Restored's project “New Chapter”, a mobile library rebuilt in a Ural-4320, Russian military truck. You are invited to walk through Kaikkonen's tunnel of shirts and to warm up by the stove in Pøbel's modified Russian army vehicle. This is for free. This is to feel free, to touch the fabric of a shirt reminding you of someone, to scroll and smell through old Russian books. Kaikkonen and Pøbel bring the reminiscent of people's lives from distant places and times. The tattered and torn everyday objects are framing the view of a prosperous Oslo, allowing us to spend time and find our own traces. Bring your family, your friends, your lunchbox, your books, your daydreams. Write or draw in Pøbel's guestbook, rest on the reindeer-skins in the army van after work. Extend the experience to a low trechold retreat, in the middle of Oslo, with Sauna Sessions during the weekends. Artist Kaarina Kaikkonen (f. 1952) has transformed sites in large scale internationally with personal garments since 1987. Hand in hand, 1200 shirts from people in Finland and Oslo are connected in the installation ‘We are still the same’ on the Arctic Pyramide Structure. Her work is presented in collaboration with The Finnish-Norwegian Cultural Institute. Komafest: New Chapter is one of 110 artworks that have been accepted this year for the State Art Exhibition, Høstutstillingen. Specifically, it's a mobile library rebuilt in a Ural-4320, Russian military truck. The building materials for which originate from 40 buildings and homes have already been or will be demolished in the small fishing village of Teriberka, Russia. This material has been made available as a result of an ongoing forced relocation process. Teriberka is a community on the coast of the Barents Sea, which has a strong historical link to Vardø via the Pomor trade. This Library is part of a larger site-specific project that has been ongoing for three years, the initial concept for which was conceived by Pøbel in 2015. It has evolved over time and is now a collaboration between Pøbel, placemakers Vardø Restored. The core of the books in the library have been salvaged from the abandoned school and supplemented with material donated by community in Teriberka. The process of building the library, has a symbolic value as a meeting point for people from Vardø and Teriberka. Both communities, as a result of privitization, are gradually losing the right and opportunity to live from local resources. This is a story with a local voice but with a global perspective. The library is the starting point for the exchange of experiences and understanding of common challenges. Teriberka is a case study and possible future scenario for what can happen to local communities around the world when traditional living and industry disappear in favor of major external and commercial interests. In other words, the library is a mobile archive of a Teriberka's history and culture that is disappearing. The processes itself of building and community engagement can help to renew an awareness and pride about local cultural heritage. A Komafest, to awaken a future confidence and momentum in the local community and hope for a new chapter. The pyramidal structures have been developed in collaboration with architect Sami Rintala. 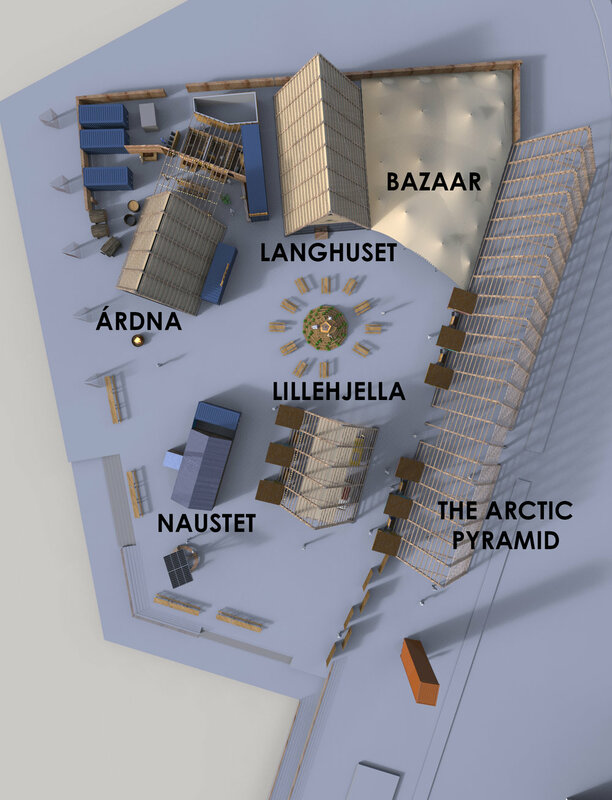 Árdna, The Arctic Pyramid, Langhuset and Naustet all make SALT an unique place for experiences and reflection where a diversity of people can be gathered to experience art and discuss today’s major challenges. The sea is crucial for the future of the planet. How can we ensure a sustainable sea for future generations? What can we learn from the coastal people’s ability to live with and out of nature? SALT was first erected on Sandhornøya in Nordland in 2014. The project has since visited Bergen and is now in Oslo until 2020 when the journey continues to the north. Thus, SALT Oslo becomes a two-year festival. The program includes concerts, lectures, exhibitions, debates and family events. Throughout all seasons visitors can relax in the sauna, quench their thirst and eat tasty food from the sea. Previous artist: Yang Fudong, BJ Nilsen, HC Gilje, Justin Bennett, Jana Winderen, Signe Lidén, Tatjana Gorbachewskaja & Katya Larina, Cecilie Jonsson, Lonnie Holley, Margrethe Pettersen and Edvine Larssen. Questions about SALT, booking and other requests can be sent to info(at)salted.no. Some questions is already answered here. Want to book one of the saunas for a bigger group? You can email us in Norwegian, Swedish, Danish and English and we'll get back to you as soon as we can. We have lots of partners and friends making every day at SALT a blast. Please say hello to them! How to get here? It’s a 5 minutes walk from Oslo Central Station. Follow the harbor promenade in direction towards Vippetangen. The closest location on GPS is Langkaia 1. Interested in renting a space at SALT? Email us at info(at)salted.no and we’ll help you make your event or meeting happen! Langhuset rises 12m above the ground. The gigantic fish rack is just as adaptable as a true Northern Norwegian. With it’s 180sqm Langhuset can accommodate everything from dinners to seminars, film screenings and concerts. The fish rack is covered by a roof and has a glass front facing the outside area, and has its own bar and stage. Árdna is a Sami term meaning “the pursuit of a hidden treasure, a secret". Every weekend, the room is used as a sauna, one of the world's largest. The building consist of an amphitheater in the front with glass windows that overlook the Opera House and Barcode, and a foyer with it’s own bar. In the amphitheater has been lectures, concerts and film screenings, both with and without the steamy heat from the sauna ovens. In the foyer under the amphitheater there’s plenty of room for larger and smaller companies. The room is suitable for both seated and standing gatherings. Among major fish racks, tents and saunas SALT offers the meeting between urban and rural, north and south, coast and land. With a mix of art and culture SALT livens up their urban surroundings. On their 5000sqm has SALT houses festivals, markets and a sea of food trucks with food from all corners of the world. The area can be used in whole or enclosed completely or partly in for events in one or more of the area's venues. It’s possible to use the outdoor bar and set up more serving points if needed. We can also help you to customize facade branding on the racks or elsewhere on the site for your events. In the middle of the Northern Norwegian fish rarcks, we find Bazaar, a fresh and warm impulses from nomadic desert cultures in the Middle East and North Africa. The bedouin tent is SALT’s largest venue with 450sqm. The tent's front wall is made of old windows and wood that create a warm and rustic feel towards SALT's outdoor area. Events like club nights with DJs, markets, literature festivals and seminars have been hosted in Bazaar after it was set up earlier in 2018. The tent has it’s own bar and possibilities for both dining tables, a stage or cinema seating. In the heat from the fireplace, among interior that reminds you of your grandmother's old living room, Naustet offers SALT's most intimate atmosphere. Naustet is SALT's smallest venue, and perfect for smaller companies, meetings or small concerts. There’s a bar and access to a private sauna. Naustet is normally open for the public every day, but is available for rent when the café is closed (mainly from October-April). SALT owns a full PA and backline that can be rented if needed. When there’s a need for additional technique, stage or staff, we’ll rent this. More info about out technique, backline and PA here (in Norwegian). Technique rent to artistic productions are free of vat.